Shown with optional writing table storage box, and wire basket. Popular with workers who stock shelves or pick orders, this uniquely-designed truck offers easier access to items on the bottom shelf. 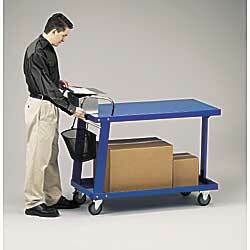 Three shelf support legs, rather than four, ease loading and unloading of large boxes and bulky items. Ergonomic dual chrome-plated handles. Two rigid, 2 locking swivel casters. Ships via small package carrier. Color: blue. IN STOCK. XA-1800 70	 2	 ??" 18" x 36"	 ??" XA-1801 80	 2	 ??" 24" x 36"	 ??" XA-1802 90	 2	 ??" 24" x 48"	 ??" XA-1803 Writing Table/Storage Box	 Wt. 10 lbs. XA-1804 Wire Basket	 Wt. 4 lbs.